Cowboy Action Shooting has become a very popular sport or pastime in the past couple of decades, marrying America’s love with all things Wild West and competition shooting. Of course, most modern single action revolvers are not chambered in the original calibers used in that era as many of those are now defunct. Instead, modern cartridges are generally used for the events, if for no other reason than the cost of using period-correct calibers would end up being prohibitive due to lack of availability. .44 Magnum is a pretty popular caliber in single-action revolver, particularly Ruger who maintains a full (and extensive) line of single action revolvers. However, the big bore. 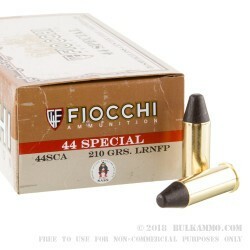 44 Mag is not ideal for this sort of shooting with it’s tremendous recoil. Enter the venerable .44 Special. The .44 Special has seen a lot of miles and has been around for a long time. 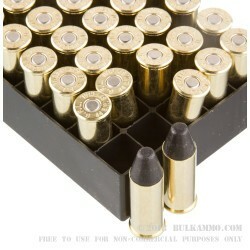 It is fully compatible with any .44 Mag revolver, but with a whole lot less recoil and noise. 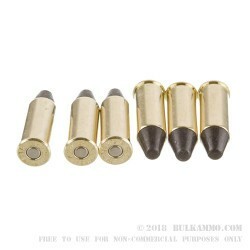 These 210 grain lead round nose slugs with flat points are a good selection for cowboy shooting: accurate, low recoil, less report than the magnum. Another added benefit of this load is that they are indoor-range safe, which may not affect everyone but those who need it will appreciate it. 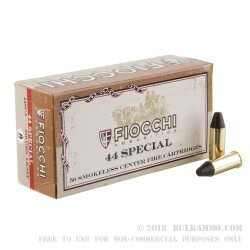 If Cowboy Action Shooting is your thing and your hog leg is chambered in .44 Magnum, give these a try. Your wrist and ears will thank you, and it just might be a little more realistic. Also, they are priced right so don’t wait around; bulk up today.